In an amazingly effective sequence that sets up all that follows, a young girl witnesses a man being savaged by an alligator at an animal park and then decides that she was more sympathetic to the alligator. Not only does she side with the aggressor but she takes one home, albeit a baby alligator who she dubs Ramon. Apparently Dad was drinking when he took the family to the alligator park and agreed to let his only daughter bring the baby gator home, because days later in a fit of rage (and sanity) he arrives home in a frenzy of energy and abruptly flushes little Ramon down the toilet. 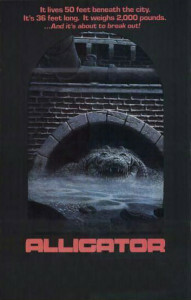 A couple decades later and strange things start bobbing up in the city’s sewers. Dogs. Human limbs. That kinda thing. The police are called in and task of solving this case is given to David (Robert Forster). He questions an animal research scientist and a lizard specialist named Marisa. Both experts look to quash any thought of a giant animal somehow being responsible – for different reasons though. Having run out of ideas David teams with a brash loudmouth and the new duo venture into the sewers. Stuff happens. Only David returns to the surface, just in time to find that some of the media wonder if he is responsible for his new partner’s death. This seems like a long bow to draw, but it is drawn nonetheless. The film actually more than pays its way with one brief sequence during which Ramon (I guess we’re on first name terms) bursts forth from the sewers through the pavement and onto the city streets, after which time he wanders off in search of food and water. Luckily he finds much two legged food standing about gawking vacantly at this 30 foot dinosaur. 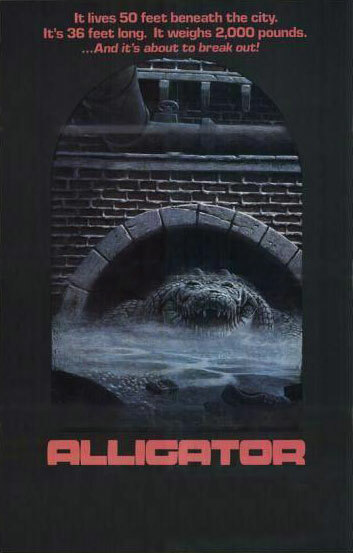 Alligator is a hopelessly dated monster flick that still maintains an awkward charm, most of which emanates from the relationship between David and Marisa. It is exactly as bad as you think it will be, but a lot better than it should be, especially seeing as it is three plus decades old. Final Rating – 7 / 10. The modern day Anacondas and Lake Placids might rock better looking animals, but sometimes the classics still hold up, even some of the deliberately crappy B grade ones.